Austin Lively is a struggling, disillusioned screenwriter whose life is suddenly changed forever when he opens a door and is unwittingly transported to a fantastical medieval realm. Austin finds himself wielding a bloody dagger while standing over a very beautiful and very dead woman. Bewildered and confused, he is seized by castle guards and thrown in a dungeon. Just when he begins to fear the worst he is suddenly transported back to reality in LA. Did that really just happen? Has he gone insane? Was it all a dream? Did he have a brain tumor? Desperate for answers, he sets out to find them and discovers that the mystery can only be unlocked by a strange piece of fiction that holds the truth about the magical kingdom. But he isn’t the only person searching for the missing manuscript, and his rivals will stop at nothing to get it first. To complicate matters more, Austin soon discovers that he has no control over when he passes between worlds, and finds himself out of trust for even the simple things, like walking through doorways. ©2018 Andrew Klavan (P)2019 Brilliance Publishing, Inc., all rights reserved. Klavan is a master word-smith. 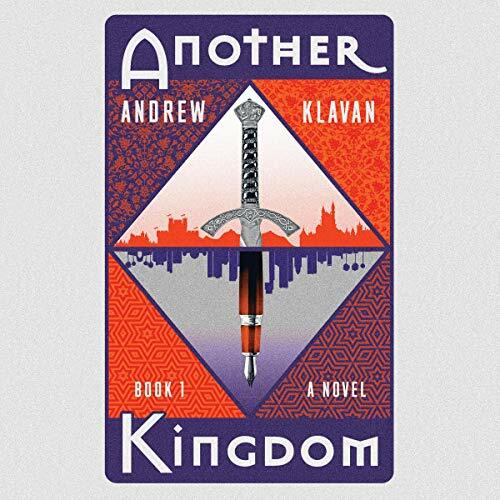 This book, along with Michael Knowles incredible narration, seems to transport you into the world of the book, much like Austin Lively is transported between worlds. The subtle moral and political theme of the story add a deep and rich complexity, much like Ayn Rand’s classic novel, “Atlas Shrugged” does, disguising her philosophy in a fiction setting. I loved the podcast that Andrew and Michael did of this story ( I listened to it twice and recommended it to everyone) . This really is an example of how good a writer Andrew is. l was pissed when Andrew announced after 2 seasons of the podcast that he was putting out the book because now I'm going to have to wait longer to get to the conclusion. I was also a little pissed that Andrew was promoting preordering the book to get all this bonus stuff that you couldn't get with the audiobook. So thankful for this story! Another Kingdom is such a rich story told in a truly creative fashion. The unique way that the two worlds, or kingdoms, exist simultaneously, each full of their own problems and characters, helps to carry the story forward in a brisk, suspenseful, and action packed way without overlooking the characters who take you along for the ride. The author is not afraid to explore the deeper, often unspoken feelings that are found within in the hearts of men, and he frequently contrasts the main character’s knowledge of what is true and good with his desire to avoid the many evils that have to be overcome. I really enjoy how the main character grows throughout this story and how his humanity is what makes his heroism all the more heroic. I can’t recommend this book enough and am thoroughly looking forward to the next two! Let wisdom reign! I enjoyed the story and went in knowing it was going to be a part of a series. That being said I don't like when a book doesn't have an ending. I understand that there was going to be threads of the story that would be drawn out through the series but there were no closure on any of the story. None. No questions were answered. everything is left hanging. Drew you do not know just how on the edge this kept me. Between Austin's constant back and forth journeys in between and his struggle to become both a hero and an antihero, this story is one of the best fantasy reads I have picked up in quite some time. Well done sir, well done. Narration was good with so many voices to perform. At first I thought, 'why only 4 stars'? As I got into the storyline, I let that go because I was hooked. A little bizarre initailly but I couldn't put it down. I am ready for Book 2... hurry!